Submitted by Dette_McLoughli... on Mon, 13/07/2009 - 16:03. Britain became the first country to halt arms exports to Israel in response to its Gaza offensive, rescinding five export licences for parts used on warships which were deployed in the conflict. An Israeli official said that Britain had reviewed 182 licenses before deciding to revoke the five in connection with the Saar 4.5 class corvette. The British Embassy in Tel Aviv confirmed the move but said that it did not constitute an embargo on Israel. Submitted by Dette_McLoughli... on Tue, 07/07/2009 - 01:15. The two Irish citizens kidnapped by the Israeli state last Tuesday - Nobel Laureate Mairead Corrigan Maguire and Derek Graham - will be deported to Ireland tomorrow Tuesday 7th July. Their flight IZ921 will arrive at Dublin airport at 19.40. The Ireland Palestine Solidarity Campaign (IPSC) will be organising a welcoming committee at the airport, and there will be a PRESS CONFERENCE with Ms. Maguire and Mr. Graham at 9.00pm in the Malton Room, Radison Blu Hotel beside Dublin Airport. A number of elected representatives have also expressed interest in speaking at the event. Submitted by Dette_McLoughli... on Sun, 05/07/2009 - 02:04. Submitted by webmaster on Wed, 01/07/2009 - 12:53. 19 of the passengers of the Free Gaza boat 'Spirit of Humanity' - including Nobel Laureate Mairead Corrigan-Maguire and IPSC member Derek Graham, abducted yesterday in international waters, continue to be held by the Israeli military. Two Palestinian members of the team were released earlier today. The IPSC is holding an emergency protest today Wednesday 1st July, 5pm, at the GPO on O'Connell Street, Dublin. We encourage you to come along to demand the release of the kidnapped members of the Free Gaza Movement - demand their release, demand the return of the supplies, demand the release of the boat, demand a safe sea-passage to Gaza, and demand that the brutal siege of Gaza be lifted. Submitted by IPSC on Tue, 23/06/2009 - 15:20. 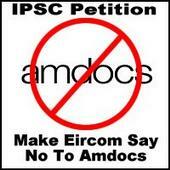 The Ireland Palestine Solidarity Campaign / Irish Anti War Movement Eircom-Amdocs campaign is drawing to a close. We will be handing in the petition this Friday 26th July @ 4pm at the Eircom Offices, the intersection of St John's Rd West and Military Road, down near Hueston Station (see map). Chris Andrews TD (FF) and Proinsias De Rossa MEP (Lab) have confirmed that they will attend and a number of other politicians are still TBC. We would like to invite anyone who is free to attend on Friday and help us to mark the end of this campaign. Eircom are still refusing to divulge whether they have actually signed the contract with Amdocs or not, but we intend to make them aware of the sentiment among the Irish public in favour of divestment from Israeli companies. Submitted by Dette_McLoughli... on Sun, 14/06/2009 - 23:29. At 7.30 in the morning on 3 June, a seven-month-old baby died in the intensive care unit of the European Gaza Hospital in the Gaza Strip. lung infection which was treatable.